A new 35 mm high profile that makes the new Scirocco aluminum wheel unique. Aerodynamic yet easy to handle, responsive and lightweight yet with all the advantages of a clincher wheel with aluminum braking track. Suitable for any kind of route, the new Scirocco meets the needs of amateurs and "granfondo" fans and even cyclists with a marked “racing” spirit. Lots of technology and performance even at the first sprint. The Scirocco wheel is entirely hand-assembled by a specialised Campagnolo® technician and is checked in every tiny detail with electronic instrumentation. 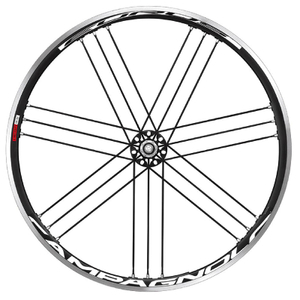 This ensures maximum performance and reliability for all Campagnolo® wheels. I purchased these wheels back in August 2018. They arrived when I was on vacation and I couldn't wait to get them on my bike to check them out. They are a bit heavier than I expected but they are quite strong. I was riding in Illinois where the roads are mostly flat. Since then I have moved to San Antonio Texas and the roads here are somewhat hilly. The roads have way more friction on them too. I have been riding on chat roads and roads that are broken up and are bumpy. I was afraid that my wheels would not handle this rough environment. So, after a month of beating these wheels up on the rough and bumpy Texas roads they have handled it quite well. They are stiff enough going up the steep hills and the longer grade hills, too. They are strong wheels that can handle the downhills as well. The weight issue doesn't bother me. These are strong wheels and dependable. If I switch to 25mm tires they will probably even more comfy on these killer roads. I am looking to buy another pair at the low price they are going for now. Great training wheels and very durable! Excellent product for training or racing on tough roads!! UPDATE #2: over 3800 miles, and wheels are still as true as new. This is amazing, since I am no lightweight, and ride some pretty rough roads. Bearings are fine, but I don't often ride in the rain, so I may not be really stressing them too much. Very good first impressions of a good looking set of wheels. They feel very smooth on first ride, rolling extremely well. A massive improvement on the stock Oval wheels which came on my Fuji Transonic - the Sciroccos look awesome with the aero frame. The new Sciroccos look almost identical to the Fulcrum Racing Quattros, which I have had on the winter bike for 2 years, which are also a very good aero wheel set. The only difference being the spoke pattern on the rear wheel of the Sciroccos, which look even better than the Quattros. Time will tell with wear and tear, but if the Fulcrums are anything to go by they should last well, as they probably came out of the same factory. A great looking set of wheels at a bargain price with next day delivery included in the price - cheapest on the internet with the next day delivery. 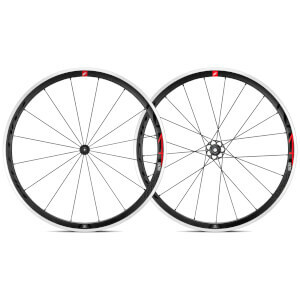 A fantastic first wheel upgrade for any cyclist. A big thank you to Probike Kit. The CAMPAGNOLO SCIROCCO C17 CLINCHER WHEELSET 2018 wheels showed up while I was on vacation. I couldn't wait to open the box, almost like Christmas when I was a little kid!! I really like the way they were packed in the box. After mounting tires and tubes and securing these beauties to their new home, on the bike I ride, we went for a ride. I have put about 250 miles on them. Smooth ride and a great feeling on the corners, excellant control on descents and uphill, too. These wheels are my faves at this point. They were a great deal and the ride makes it even more of a deal than the price! I ride almost everyday, these will be my best friends everyday. I am so happy I bought these wheels. Bought these after a rim cracked on my set of Mavic Ksyrium Elite S. Didn't want to spend much so went with these and haven't been disappointed at all. Solid and stable after ~1000km or so. May not be the most dynamic wheels but for the price I'm wrapped. I have these wheels on two different bikes. They are solid and predictable. The worst you can say about them is that they are a unpredictable at high speeds in heavy cross winds. What aero wheels aren't? As for weight comments, when you're talking about one ounce difference between the lightest set of wheels and the heaviest you're getting pretty sensitive don't you think? 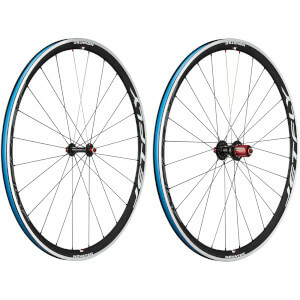 These are good wheels and if I want another good set of training wheels I will buy them again. Probikekit offers the best prices around and I use them almost religiously. Mileage now over 1100 miles, and still as true as when I took them out of the box. Very pleased with these. Great wheels super fast service!!! Thank you!! !